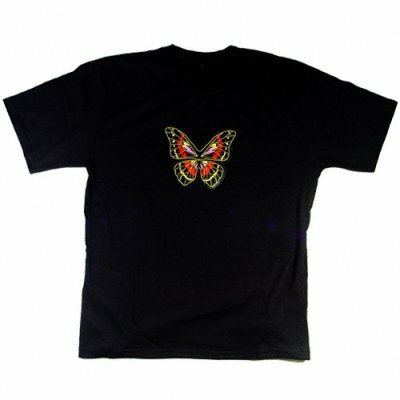 Successfully Added Flashing Butterfly EL T-Shirt - Medium to your Shopping Cart. EL (electro luminance) T-shirt with a flashing butterfly designed securely sowed on in large size. Take this eye catching T-shirt with you to the club or for any other lowlight or night time activity, and everyone will be floored with how great the multiple colors on the butterfly shine. Simply press the on button on the attached remote, and let the fun begin. A no MOQ item, with a super low wholesale price means you can buy one for yourself, or resell them for great profit to others.